The United States Air Force Expeditionary Center is the Air Force's Center of Excellence for advanced expeditionary combat support training and education. It consists of the Mobility Operations School, Expeditionary Operations School and the Expeditionary Combat Support section. The United States Air Force Expeditionary Center was first opened as the Air Mobility Warfare Center on May 1, 1994, and officially received its mission on Oct. 1, 1994. At first opening, the Center operated the Phoenix Ace Combat Readiness Exercise and Evaluation Course, Mobile Air Tactics School, Force Support and Readiness Course, Maintenance Training Qualification Program Course, Air Transport Manager Course, Director of Mobility Forces Course, Environmental Control Unit Course, Intermediate Wartime Contingencies Course, Cargo Operations and Systems Course, Passenger Operations and Systems Course, Command and Control Information Processing Systems Course. The Center, which was officially renamed the United States Air Force Expeditionary Center on March 4, 2007, is the Air Force's leader in expeditionary training offering over 90 courses, and on January 7, 2011, the Center expanded in scope, taking added responsibility for evolving Air Mobility Command (AMC) mission sets. These include installation support missions unique to three Joint Bases within the Command, as well as at two AMC bases where missions are evolving as a result of previous Base Realignment and Closure (BRAC) decisions. Courses at the Expeditionary Center include the Combat Airman Skills Training course, Air Force Exercise Eagle Flag, Air Force Phoenix Warrior and Phoenix Raven Training Courses, Advanced Study of Air Mobility, Aerial Port Operations Course and more. Through all of the courses – whether in the classroom, in the field, or through distance learning, more than 24,000 students are trained on how to build "Airpower...from the ground up – from the Flightline to the Frontline." The United States Air Force Expeditionary Center is the Air Force's Center of Excellence for advanced mobility and expeditionary combat support training and education. The Expeditionary Center provides command oversight to five AMC units and two unique schools. Located on Joint Base McGuire-Dix-Lakehurst, N.J., the USAF EC partners with Air Staff, AMC, Air Education and Training Command and the U.S. Air Force Warfare Center to provide a disciplined training process that assures the right skills are taught at the right time across the expeditionary enterprise. The USAF EC maximizes Expeditionary Combat Support assets to meet emerging missions, and most importantly, is accountable to provide standardized and ready forces to enable "Airpower...from the ground up!" The Expeditionary Center’s eight subordinate units consist of the 43rd Airlift Group, Pope Air Force Base, N.C.; the 87th Air Base Wing, Joint Base McGuire-Dix-Lakehurst, N.J.; the 319th Air Refueling Wing, Grand Forks Air Force Base, N.D.; the 621st Contingency Response Wing, JB MDL;the 515th Air Mobility Operations Wing, Joint Base Pearl Harbor-Hickam, Hawaii; the 521st Air Mobility Operations Wing, Ramstein Air Base, Germany; the 628th Air Base Wing, Joint Base Charleston, S.C.; and the 627th Air Base Group, Joint Base Lewis-McChord, Wash. Both the 87th Air Base Wing and the 628th Air Base Wing are the Air Force leads on Joint Bases that host AMC flying wings, along with other DoD partners. The 43rd Airlift Group and 627th Air Base Group enjoy unique partnerships with the U.S. Army, while the 319th Air Refueling Wing supports the Department of Homeland Defense and Air Combat Command emerging missions. The 515th and 521st AMOWs, along with the 621st CRW, are responsible for en route and expeditionary combat support, contingency response and partner capacity building mission sets around the globe. The USAF Mobility Operations School (MOS) prepares the Airmen that get America to the fight. Using both resident and on-line instructional media, the USAF MOS offers 78 courses that prepare graduates to perform their mission by educating, training, and exercising Department of Defense personnel for worldwide expeditionary and mobility operations. Courses cover topics in logistic readiness, deployment, maintenance, air transportation, aircrew resource management, air mobility operations, contingency response, and command and control from both global and theater perspectives. 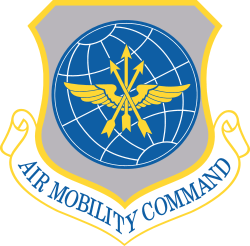 The MOS also offers the Director of Mobility Forces Course and the Advanced Study of Air Mobility (ASAM) Intermediate Developmental Education graduate degree program. The MOS graduates more than 13,000 students annually, Airman through Flag Officer, representing active duty, Guard, Reserve and civilian personnel. The USAF Expeditionary Operations School (EOS) is the Air Force Expeditionary Combat Support Center of Excellence dedicated to educating, training and exercising expeditionary combat support personnel in deployed operations. The EOS has operational control of the 421st Combat Training Squadron and 422d Joint Tactics Squadron and is responsible for developing and conducting Combat Airman Skills Training, Security Forces pre-deployment training, expeditionary staff training, mobility intelligence education and facilitating the Air Force exercise Eagle Flag which focuses on the integration of all Expeditionary Combat Support skills. Additionally, the school has oversight of several Security Forces-specific training programs through its Phoenix Raven, Phoenix Warrior and Tactical Security Element courses. Underpinning expeditionary operations and training, the EOS is the central repository for Expeditionary Combat Support Lessons Learned and Tactics, Techniques and Procedures (TTPs) for all Expeditionary Ground Forces. Overall, EOS offers 15 expeditionary combat support and logistics training courses. On average, the EOS trains more than 5,000 Airmen every fiscal year. The Expeditionary Center Support (ECS) Directorate's mission is to ensure the Expeditionary Center creates and maintains a campus dedicated to an environment conducive to world-class innovation, instruction and learning. Additionally, the ECS is responsible for instructor standardization, curriculum development and student logistical support. ECS provides extensive campus-wide multimedia and communications support as well as USAF EC-wide mission support functions. To that extent, ECS is responsible for or provides oversight of office automation solutions, telecommunications, the local area network, the USAF EC public, private and secure web sites, video, photo, graphics, presentations, multimedia support, video teleconferencing services, classroom maintenance, fitness center, facility and personnel security, manpower, contract procurement, fiscal management, facility maintenance and renovation projects, and strategic planning. ECS also manages extensive campus-wide information technology, grounds and custodial contracts. With more than 40 military, civilian and contractor personnel, ECS supports more than 480 USAF EC cadre, staff and 7,000 in-residence students each year. ↑ "U.S. Air Force Expeditionary Center". U.S. Air Force. http://www.expeditionarycenter.af.mil/library/factsheets/factsheet.asp?id=11306. Retrieved 14 March 2012.